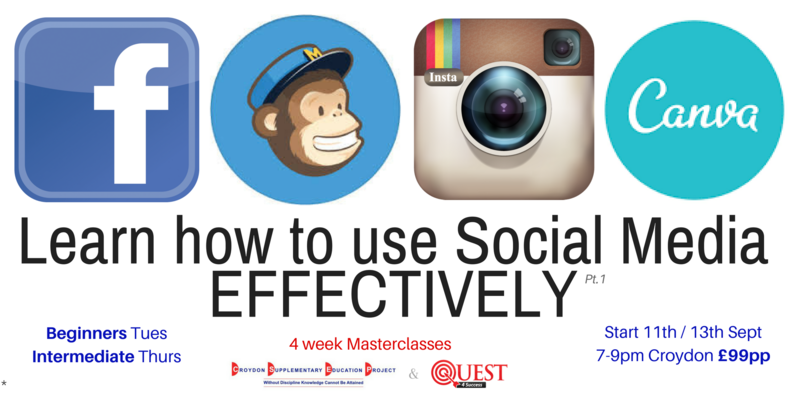 I train businesses and people how to maximise using Social Media Networks for projects and business. For 2017 and beyond, more training will be online based, meaning you can train in the comfort of your home/business at a time suitable for you. Workshops range from Beginner, Intermediate, Business, Advanced and PRO in each of the following networks: Facebook, Twitter, Pinterest, LinkedIn, Instagram, Hootsuite, Blogging, Graphics for Social Media posts (Canva & PicMonkey), Mailchimp for Email Marketing and using Wix or WordPress to create your own Website. 2016 Workshops took place at Impact Hub Brixton based in Pop Brixton and previous workshops were held in Southbank University during 2015 for established Entrepreneurs and Small Businesses. A crash course in the popular and alternative Social Media networks. This workshop is for people who would like to know more about the capabilities and benefits of specific social media networks. Starting with 2 levels, the Beginners classes will be on Tuesdays and Intermediate classes will be on Thursdays. The beginners class is on Tuesdays and is aimed at those that have little to no exposure in the following platforms as we go through each of them individually every week. 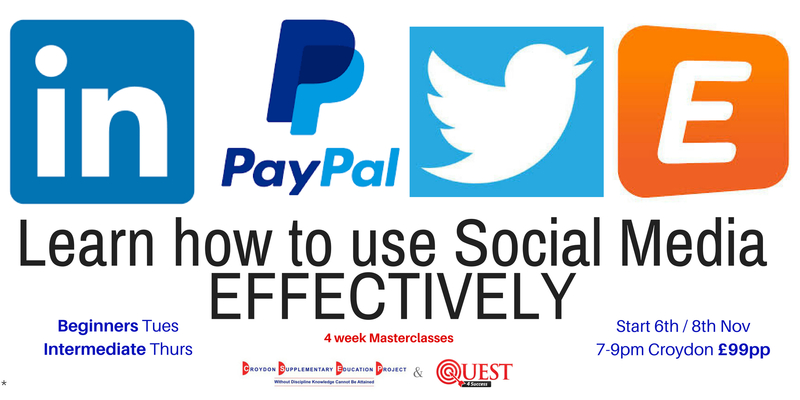 This masterclass has been created to give attendees confidence and understanding to use the above 4 social media networks. Having an effective presence online has a positive response to your interactions online, allowing you to engage with friends and family with ease using any of these sites. Mailchimp (Email Marketing - newsletters & email campaigns etc). Facebook is a popular social networking website that allows registered users to create profiles, upload photos and video, share links and send messages and keep in touch with friends, family, colleagues, businesses, customers and meet new people in groups or via business pages. With 5 varying levels for this workshop, candidates are taught everything from basic features in the beginners class to advanced power editor ad features in the PRO class. Intermediate: Look at pros and cons of personal vs business/fan page, how to navigate around and engage with people on facebook. Twitter is a social networking microblogging service where users post and interact with messages and “tweets,” restricted to 140 characters. Registered users can post tweets, but those who are unregistered can only read them. With 4 varying levels for this workshop, candidates are taught everything from basic features in the beginners class to more advanced advert features in the Pro and Advanced classes. Beginners: For people new to Twitter- creating your A/c, how to navigate around and engage with people on twitter publically and privately. LinkedIn is a business and employment-oriented social networking site designed specifically for the business community. With 5 varying levels for this workshop, candidates are taught everything from basic features in the beginners class to advanced target marketing in the PRO class. Intermediate: Understanding endorsements and recommendations, look at pros & cons of business vs personal profiles, market researching your audience & peers. Business: Creating and monitoring a business page, engaging in groups effectively, controlling your online visability, monitoring your analytics, creating blogs in Pulse. Advanced: How to attract & find your audience, creating your own group, using adverts. Instagram is an online mobile photo-sharing, video-sharing, and social networking network, that enables its users to take pictures and videos. With 4 varying levels for this workshop, candidates are taught everything from basic features in the beginners class to advanced advert features in the Advanced class. Intermediate: For those familiar with Instagram already. Engaging with potential customers your audience, Understanding the importance of hashtags. Advanced: Using adverts, using adverts with facebook, optimizing your profile, Embed photos, badges, widgets & feed to website, Guest talk with Guest Instagram Influencer Jayde Pierce – Insta Celebrity with 1/2 million followers sharing INSTA tips. MailChimp is the ultimate software that will change the way you market your product on the internet. It gives you a number of easy options for designing, sending and saving templates of your emails campaigns. With 4 varying levels for this workshop, candidates are taught everything from basic to advanced features in email marketing. Advanced – Duplicating campaigns to edit and send to other lists, Add mobile App to monitor results, Add Image Groups, Introduction to Split testing. Hootsuite is one of many tools referred to as a “Social Media Management System” or tool. It helps you keep track and manage your many social network channels. It can enable you to monitor what people are saying about your brand, and help you respond instantly. With 4 varying levels for this workshop, candidates are taught everything from basic features in the beginners class to advanced features in the Advanced class. Beginners: Creating your A/c, Navigating across Hootsuite, Connecting your networks, Create and view streams for multiple networks, Schedule posts in advance. Advanced: Create several users and monitor/edit posts accordingly, Repurposing content. Canva is a graphic-design tool website allowing you to create and edit designs and documents. Beginners: Masterclass for people new to using CANVA. Create a Social Media post and include own images and logos. Insert and edit text and additional images or graphics. You can choose which of the following sessions you’d like to cover, depending on what stage you’re at with creating your site.